Here are the parameters that will be used by the major social security programs in 2019. The Year’s Maximum Pensionable Earnings (YMPE) for 2019 is $57,400, an increase of 2.7% over the 2018 YMPE of $55,900. The basic exemption remains at the current level of $3,500, which is the level applicable since January 1, 1998. Following the QPP enhancement as of January 1, 2019, employee and employer contribution rates for the QPP increase from 5.400% to 5.550% of contributory earnings in 2019, for an annual maximum contribution of $2,991.45. Please refer to our bulletin published in November 2017 for further information about the QPP enhancement. For the CPP, employee and employer contribution rates increase from 4.950% to 5.100% of contributory earnings in 2019, for an annual maximum contribution of $2,748.90. The maximum monthly retirement pension at age 65 for the QPP and the CPP is set at $1,154.58 for 2019, based on the average YMPE over the last five years. The Employment Insurance premium rate for employees in Quebec decreases by $0.05 per $100 of insurable employee earnings effective January 1, 2019. The premium rate for employees in Quebec therefore decreases from $1.30 to $1.25. As for employers, they continue to contribute 1.4 times the employee rate, with their premium rate moving down from approximately $1.820 to $1.750. These rates take into account the Quebec Parental Insurance Plan (QPIP), in place since January 1, 2006. 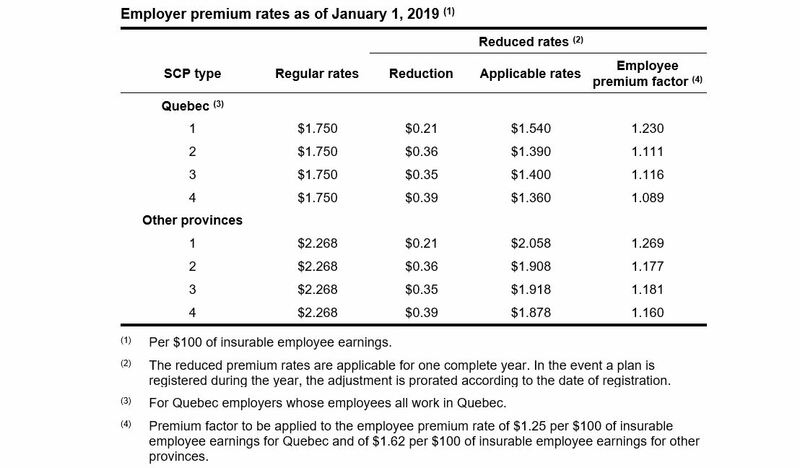 The Employment Insurance premium rate for employees outside Quebec decreases by $0.04 per $100 of insurable employee earnings effective January 1, 2019. The premium rate for employees outside Quebec therefore decreases from $1.66 to $1.62. As for employers, they continue to contribute 1.4 times the employee rate, with their premium rate moving down from approximately $2.324 to $2.268 per $100 of insurable employee earnings. The maximum insurable earnings increases from $51,700 to $53,100 for 2019. Type 1: SCP based on the accumulation of paid sick days of at least one day per month and a maximum of at least 75 days. Type 2: SCP based on the accumulation of paid sick days of at least one day and 2/3 per month and a maximum of at least 125 days. Type 3: SCP providing a weekly indemnity¹ for at least 15 weeks. Type 4: SCP providing a weekly indemnity¹ for at least 52 weeks (this reduction is only available to employers of the public and para-public sectors). It is also important to note that the Employment Insurance two-week waiting period has been revised to one week effective January 1, 2017. Hence, to remain eligible for a reduced premium rate, employees must receive an income replacement in case of disability after a waiting period of at most one week. Organizations that have a two-week waiting period and that benefited from the reduced rate on December 31, 2016, must provide a maximum waiting period of one week. Organizations have until January 2, 2021 to comply with this new requirement in order to continue to benefit from the reduced rate. The QPIP contribution rates in 2019 decrease from 0.548% to 0.526% for employees, 0.767% to 0.736% for employers and 0.973% to 0.934% for self-employed workers. The maximum insurable income increases from $74,000 to $76,500 for 2019. Note that some employers of the primary and manufacturing sectors are eligible for a reduced contribution rate. The current contribution rate will remain unchanged at 0.07% of insurable earnings in 2019. The maximum insurable earnings subject to contribution increases from $74,000 to $76,500 for 2019. In Quebec, the minimum hourly wage is currently $12.00. for all Canadian provinces and territories in 2019. ¹ The SCP weekly indemnity must be at least equal to the benefits provided by Employment Insurance. Contact your Normandin Beaudry consultant or email us. © Normandin Beaudry, Actuaires conseil inc. 2019. All rights reserved.